When Google announced the shut down of Google Reader they disappointed and somewhat upset a metric tonne of active users, myself included. I like RSS feeds. More to the point I like RSS readers, it’s the comfort of knowing that I can keep up with other bloggers, and news updates from a single and accessible place. For me that place was Google Reader and by extension an app called Reeder. Google Reader is due to be shut down on the 1st of July (tomorrow!). About a month after Google announced Reader’s end of life I started using Fever. Fever is a php based app that can be installed on a server, this means that I control the service: No one else can shut it down, no privacy concerns, and no worrying about how the service is monetised (so no sudden move to a paid only model, and no ads). Most importantly Fever is supported in Reeder for iPhone, with upcoming support for Reeder for Mac and Reeder for iPad (these apps are now free, and will support other services like feedly and feed wrangler — highly recommend you grab these apps now). There is a one-off upfront cost of $30 to license the software and you do need your own server. I’ve tried it on two different hosting companies one which was less reliable, slow to load, and did not allow cron jobs to run, however Fever remained usable through out but not at the refresh speeds that I was used to with Google Reader. The second host performed much better plus it allows for custom cron jobs which automatically refreshes the data on the server every 15 minutes – more like what I was used to with Reader. If you’ve had experience installing WordPress on a server then you’ll find installing Fever a breeze. 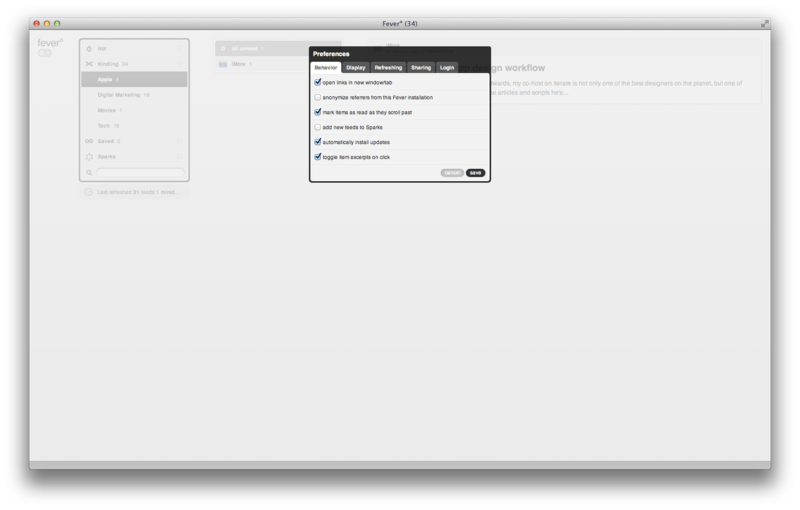 Create a database, run the install page, set up your login details and you’re done. Fever can also import your current subscriptions from a Google Reader export file, which you really should download before July 1st. 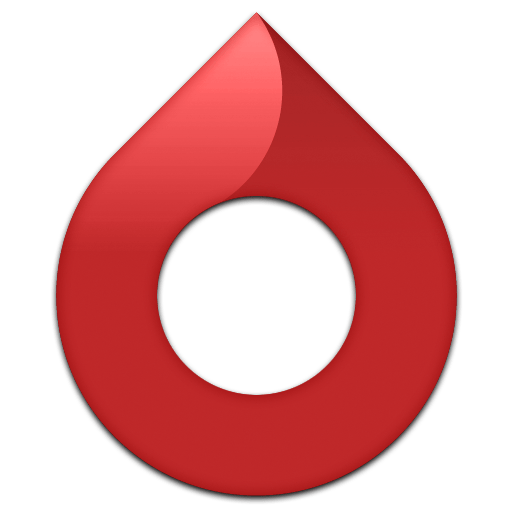 Fever has a unique feature called Hot List. Using an algorithm it’s capable of picking out the most frequently talked about topics in your feeds; then gives them a temperature (using the normal body temperature of 37°C as baseline) – the higher the temperature the “hotter” the topic. 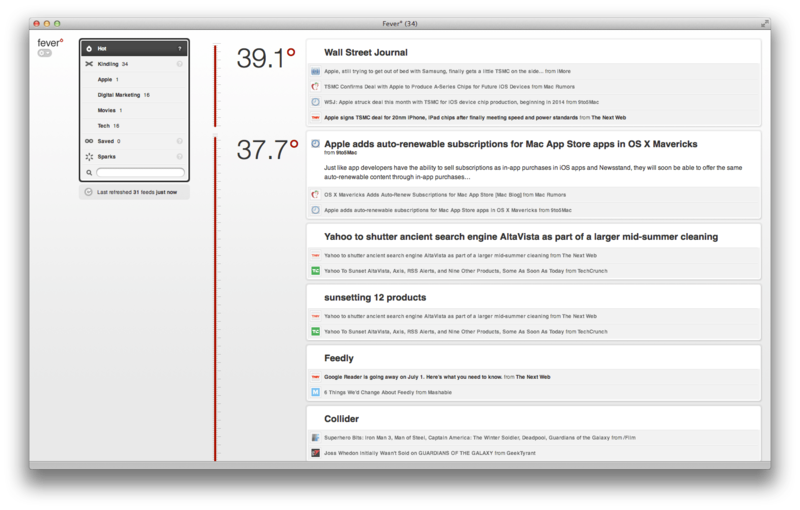 The more feeds you add the better Fever performs at picking out your ‘need to know news’. To make the most of Hot list, Fever makes a distinction between feeds classed as essential and must-read and feeds (labeled Kindling) and feeds which are more supplemental, low signal-to-noise (labeled as Sparks). Whilst clever I don’t really use it, mostly because I can generally hear about the hottest news from my Twitter feed. However I do find it particularly useful if i’m ‘offline’ for a particularly long time. Fever has a three column design: folders, feeds, and posts, as a web app it works ok, but it simply doesn’t feel as efficient as Google Reader or many other services. I find the font for the the folder/feed list to be far too small and the option buttons doubly so. On my iPad Mini this is even more noticeable, although certainly not impossible to navigate the site it is noticeably cramped difficult. However, the Fever web app is optimised for iPhone and performs much better. Fever’s saving grace is that it’s supported in my favourite RSS reader app: Reeder. Unfortunately Fever’s support is iPhone only at present, although we’ve been promised iPad and Mac support soon but not in time for July 1st. There are other iOS app that support Fever such as Ashes for Fever° and Sunstroke or if you’re and Android user there’s Meltdown and Chills. 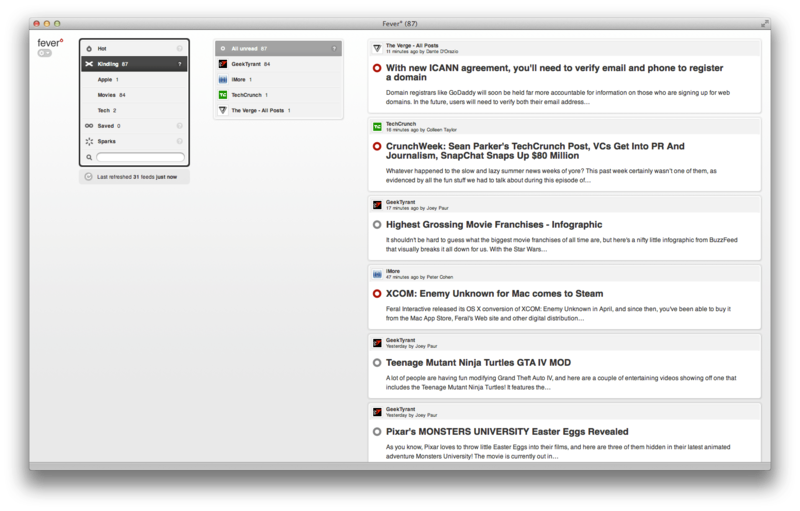 After three months of use I’m happy with Fever and how it’s handled my migration from Google Reader. Although there is room for improvement, It’s an excellent piece of software that will mature over time and gives me a sense of security in hosting my own feeds. Having said that, I appreciate that it’s not going to be for everyone and it’s certainly not going to be the go to replacement for Google Reader, but I’ll be sticking with it for now. Pick a fast hosting service that allow cron jobs. Set up a cron job to refresh your feeds regularly. Try to sort your feeds into the Sparks and Kindling categories it will make your Hot List much more intelligent. What service will you be using to replace Google Reader? Tip: If you’re looking for the degree symbol on iOS tap and hold ‘0’, something I learnt writing this post. Filed under Digital Marketing, Featured, Social Media Marketing, thisisbenjam.in, Uncategorized, Website design & Technology, yourleft. Interesting. While I like the sound of Fever, I imported my subscriptions into both Feedly and Digg, both of which I like (leaning towards Digg). Of course, I grabbed my OPML file in case I want it later. The truth is I had actually pretty much stopped using Reader anyway in favour of having fewer subscriptions in a desktop RSS client (NetNewsWire). Now I read – or at least see – everything from sites I really care about rather than ignore loads of sites I don’t. As much as I’ve tried to keep up-to-date with Reader alternatives, I’ve not bothered to actually try any. Although I do like the look of the Digg offering (and I like the idea of Digg making a comeback). I understand what you mean about not using Reader. I’ve not used the web interface for a long time, I simply took advantage of it as a service to sync my feeds across my devices – which Fever° does perfectly well. I tend to keep my feeds to a minimum and any regularly updated feed that I don’t read for over a month gets the boot – just to make sure I just get my “Need to know news” and also keep up with the less regularly updated blogs. Truth be told: I get most of my news and articles from Twitter, but when I’m working 7 hours a day it’s nice to know I’ll have all the latest news in one place.